Balloon Vine Cardiospermum Halicacabum is a climbing, tropical and subtropical perennial herb that is grown widely as an annual. Another common names of this woody climber are Heartseed Vine, Love in a Puff Vine and Heart Pea. Balloon Vine seeds produce the plant that climbs with tendrils and has square stems with deeply cut leaves. The name of the plant is Balloon Vine because it produces small white flowers that eventually form the large, ornamental, balloon-shaped seed pods. The seed pods change their color from green to somewhat red as the plant matures. 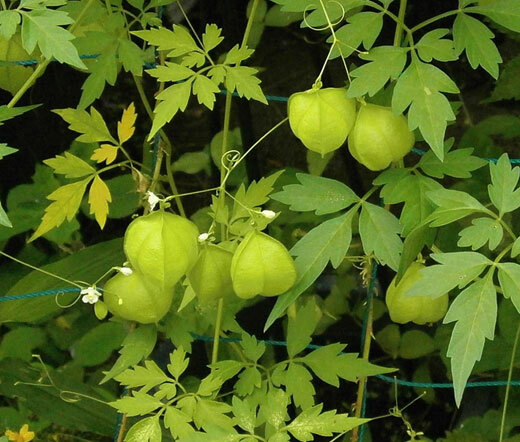 Balloon Vine is grown for its attractive bright green foliage and highly ornamental seed pods. Heart Pea is great for covering trellis-work, chain link fencing or pergola as it grows quickly and provides shade or a solid screen at no time. This vigorous climber likes to grow in full sun or partial shade and prefers moist, but well-drained soil. Cardiospermum Halicacabum is known as a medicinal herb, and its seed is used in herbal medicine. The young leaves and shoots are edible and can be cooked.